GEO magazine, German issue No. 01/2011, publishes Solvin’s story on fruit flies – Drosophila melanogaster is one of the most studied organisms in biological research, particularly in genetics and developmental biology. (‘Fliegen lernen’). 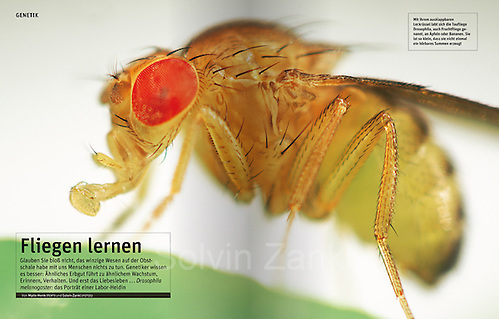 GEO veröffentlicht in der Ausgabe 01/2011 Solvins Reportage über die Taufliege Drosophila melanogaster – Ein winziges Wesen hilft der Forschung, die Geheimnisse des Lebens zu verstehen. Drosophila: Porträt einer Heldin im Labor. – (‘Fliegen lernen’). This entry was posted on Tuesday, December 21st, 2010 at 3:14 pm. It is filed under News 2011, Older posts. You can follow any responses to this entry through the RSS 2.0 feed.